One of the many joys of a trip to Ireland is jigging the night away to Irish folk music. Irish music is arguably one of the most fun and yet the most heartfelt genres. 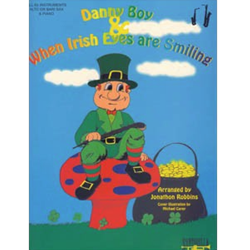 The two songs that have warmed the hearts of millions are Danny Boy & When Irish Eyes Are Smiling. Every performing musician must be familiar with these two beautiful standards which can be heard in every authentic Irish tavern on any given day. These two beautiful songs published by Santorella Publications have become an important part of American culture, yet remind so many immigrants of home. Don’t wait until St. Patty’s Day to enjoy these two great Irish melodies. This particular “Eb” edition by Jonathon Robbins is for alto saxophone and piano.